Keema Aloo Matar is one of the main course recipes popular among north Indians. 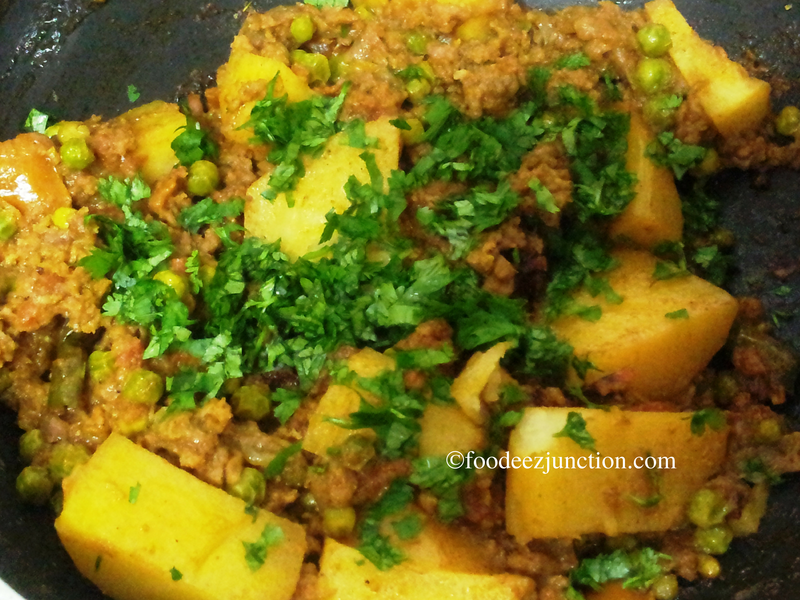 This is a non-veg recipe made using minced mutton keema (meat), potato (aloo) and green peas (hari matar). Keema Aloo Matar is equally healthy as it has both, vegetables and meat as ingredients. This non-veg cuisine is famous among South Asians too. Its place of origin is India, Pakistan, Bangladesh and Nepal. The various other cuisines that can be made with Keema are samosa and spring rolls. Keema aloo matar has many significant nutrients like proteins, carbohydrate and dietary fibre. And above all you need not worry for the bones 😉 . I like the flavours of the Indian spices, it gives a heavenly taste! In this Keema Aloo Matar recipe I have cooked all the three main ingredients, keema, aloo and hari matar, together. It brings life to this Indian food! I hope you will find this recipe an easy one. It takes only 40 minutes to cook though. This dish serves 3-4 people. Wash the minced meat or Keema nicely. Keep it aside. Take a deep cooking pan. Heat the oil for 2-3 minutes. Now add finely sliced onions and fry it till golden brown. Add ginger-garlic paste, fry it for 20 seconds. Add zeera or cumin seeds, bay leaves, cardamoms and cloves, fry it for 2 minutes. Now, add chopped tomatoes, haldi or turmeric powder, cumin or zeera, dhania or coriander powder. Mix well. Add little water to avoid sticking of masala to the pan. Cover the lid and keep on low flame. Fry all the masala for 10-15 minutes or till the oil separates from the masala. Now add minced meat or Keema. Mix well. Add very less water and cover the lid. Cook for 10 minutes on medium flame. After 10 minutes add diced aloo and hari matar. Add green chillies, red chilly powder and salt to taste. 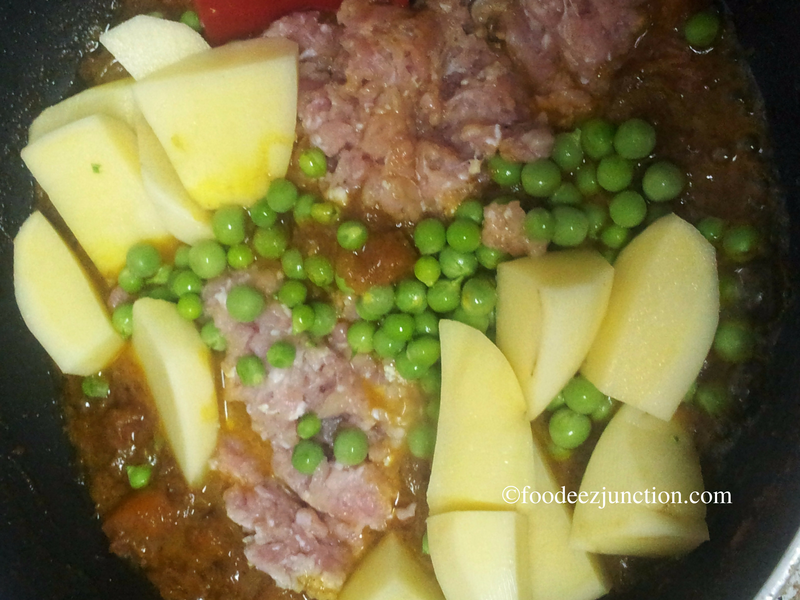 Again add some water and cover the potatoes and green peas to cook. Let it cook for at least 10-15 minutes. Now, add garam masala or all-spice powder. Cook for 2-3 minutes more, preferably on low flame, or till the extra water evaporates. Your tasty non-veg food is ready. Keep the dish little dry in consistency. Take out Keema Aloo Matar in a serving bowl and garnish with chopped fresh green coriander leaves. Serve, this delicious dish hot with puris or chapati rotis. Tip: You can add green and red chillies accordingly.